Experience a holiday unlike any other – begin your trip with the thrill of the six Theme Parks at Walt Disney World Resort® in Florida and end it with a relaxing voyage on-board a vessel designed by the magical minds of Disney. With Disney Cruise Line, every voyage is filled with wonders for holiday-makers of every age and crafted to create unrivalled experiences for the whole family. Whether you want to have fun together or unwind on your own, this is a holiday you’ll never forget. Everyone’s needs have been thought of here, from the immersive and creative children’s programs, cool clubs to keep teens entertained and the tranquil spaces for adult relaxation – it’s all here waiting for you. Experience unique family entertainment, ranging from incredible themed deck parties to spectacular original Disney musicals, and the only night-time fireworks at sea – all without having to weigh anchor. And as everything’s up to Disney standards, you can enjoy deliciously different dining every night, roam in your spacious family-sized stateroom and experience round-the-clock service to ensure smooth sailing for the duration of your journey. As you voyage across the seas, you’ll stop in at tropical ports and Disney’s very own private island paradise – Disney’s Castaway Cay – where you’ll be able to enjoy an array of activities to entertain and delight the whole family. There’s even an adult-only beach, exclusively for parents to relax and unwind in a private cabana as they take in the views of the sparkling white sands and crystalline waters. Don’t waste another moment – climb aboard the ultimate Disney holiday and let your imagination come to life as you span land and sea on-board a 3, 4 or 7-night Disney cruise to the Bahamas or the Caribbean. You can guarantee lifelong memories amidst so much magic, whichever Disney cruise you choose to add to your Walt Disney World Resort® holiday. Guests of every age will absorb the magic of Disney on this magical cruise. Young cruisers can enjoy a spectacular kids’ area where they can party with pirates and play with Disney princesses; teens can relax in their own private club and have fun at parties, and adults can escape to exclusive areas whether it’s a pampering spa treatment or enjoying a romantic meal. 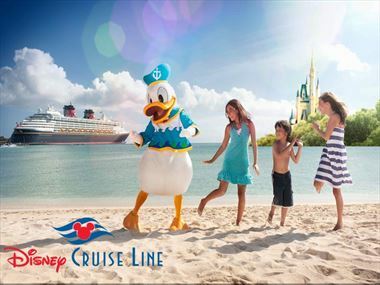 A Disney cruise offers fun for everyone, as well as plenty of enjoyment for the family as a whole. For spectacular entertainment, choose from West-end quality musicals to intimate lounge shows, family movies and dance parties to thrilling on-deck pirate parties and dazzling firework displays. Enjoy a home away from home in comfortable, spacious staterooms built with the whole family in mind. Each room has elegant Disney details and thoughtful amenities, while most include twin bathroom areas so mum can take a relaxing bath, leaving the second bathroom free. Sample a host of flavours from around the world with the Disney Cruise Line dining, with a range of delectable delights for the whole family. Share stories from the adventures of your day as you 'rotate' at dinnertime through three uniquely themed restaurants, each with a distinctive cuisine. You'll be provided with your personal servers who will accompany you throughout your cruise and cater to your every taste and craving. The adventure never ends on a Disney Cruise - snorkel in the Bahamas, visit ruins in Cozumel or go shopping in St. Thomas. Whether you want to spend time with the kids or want an adult-only excursion, there are plenty of activities to enjoy. And there's one destination that's exclusively for guests - Castaway Cay, Disney's private island paradise. Disney offers a variety of itineraries from a 3- or 4-night cruise to the Bahamas to a 7-night cruise in the eastern or western Caribbean. Most cruises stop at our private tropical island retreat Castaway Cay.